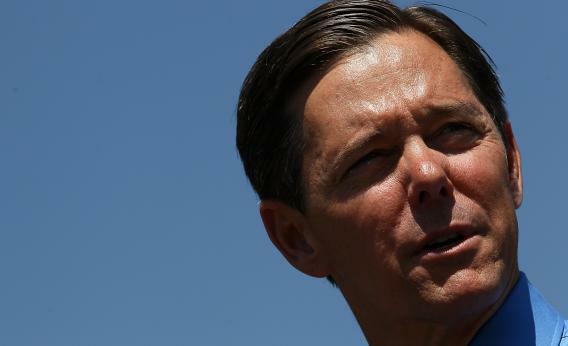 Ralph Reed: his Faith & Freedom Coalition is targeting partisan Democrats by design. Ralph Reed, founder and chairman of the Faith and Freedom Coalition, speaks at Herman Cain’s Revolution on the Hill Tax Day Rally at the U.S. Capitol April 16, 2012 in Washington, DC. As to why contact Democrats, because we are a faith-based issues advocacy organization that seeks to mobilize, train, educate, and equip people of faith to be more effective citizens, in particular evangelicals and faithful Roman Catholics. Especially if you’re seeking to move and motivate Catholics on issues, you’re dealing with a community that is still about one-third Democrat (that’s frequently Mass-attending Catholics). We’re not the RNC or the a GOP candidate committee. So the point in your piece that we may have communicated with a Democrat in VA may be a critique of a Romney or RNC — of that I’m not sure. We communicate with voters based on issues, not party or candidate identification. That goes for evangelicals as well. After all, Obama will get about 20% of the evangelical vote, which is one out of every five evangelicals. Are we not to communicate with them either? I think we should, and we do.